The monument was designed by Michael Sandle, a prolific and important sculptor worldwide and assembled on the initiative of the George Cross Island Association to commemorate the 50th anniversary of the presentation of this award to Malta. The Valletta Rehabilitation Project, under the headship of its chief executive officer and coordinator Ray Bondin, was responsible for its construction. The surrounding landscape is part of the Castille bastion underlying the Lower Barakka Gardens. 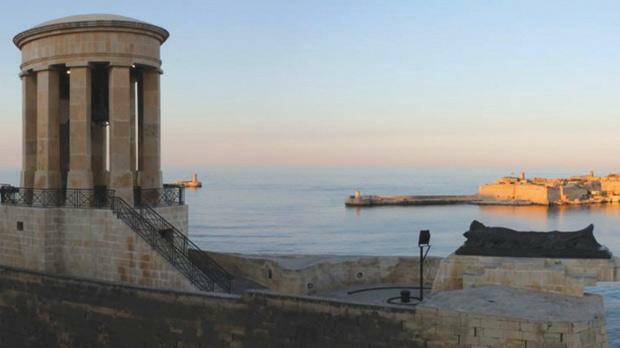 The site was specifically chosen because it marks the furthermost point of Valletta within the Grand Harbour and is secluded to complement the meditating nature of the scope of the monument while the bell tolls solemnly in commemoration of the fallen heroes. The design of the structure consists of a belfry in the form of an elliptical neo classical temple supported by 10, square-faced columns. The collonaded belfry contains a huge bourdon bell which is the largest bell in Malta. The columns rise from a high base designed on the plan inspired from the form of the George Cross. Further from the belfry a bronze catafalque symbolising the burial of the corpse of the unknown soldier at sea, overhangs the bastion parapet. The inspiration of the monument is based on the Maria Gloriosa mediaeval bourdon bell of Erfurt Cathedral in Germany. The tolling bourdon bell was intended to build up a drone, its tone solemnly lamenting the demise of the bellic heroes across the waves of Grand Harbour. The bell was cast on February 10, 1992 by the world’s largest bellfounders John Taylor & Co Founders of Loughborough England. A Latin inscription adorns the mulley groove of the bell stating a verse in latin from Psalm 140 Obumbrasti Super Caput Meum In Die Belli MCMXL – MCMXLIII which translates to “You cast thy shadow upon my head during the time of war 1940-1943”. Mepa scheduled the Siege Bell memorial as a Grade 2 national monument as per Government Notice number 522/12 in the Government Gazette dated May 8.